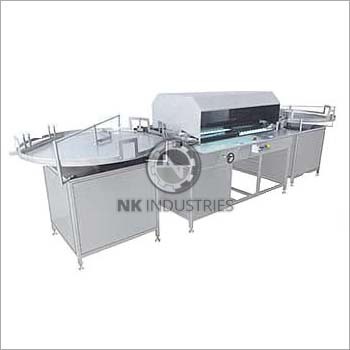 Automatic Dry Powder Visual Vial Inspection Machine named Model NKVI-250 is used for inspecting vials after Vial sealing has performed. Inspection is required to check problems with fillings, breakages or any other problems. Dry Powder Visual Vial Inspection Machine carry out inspection with minimum human intervention. The whole machine is constructed with SS material and machine structure is also made with SS. Whole Body Is Manufactured Using Premium Grade Of PVC Coated AISI 304. Integral Turntable At Both In Feed And Out Feed Side Of Machine. Reduction Gears Guarantee Tweak Free & Soundless Operation. Can Be Used For Varying Size Of Vials With Various Change Parts. Magnified View Of Vial During Inspection Process. Inbuilt Auto Rejection System For Rejected Vial. Machine Speed Can Be Varied As Per Production Requirement.